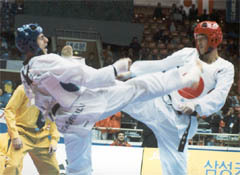 Hundreds of world's top-notch taekwondo practitioners as martial artists gathered at the World Taekwondo Headquarters (Kukkiwon) in Seoul for the first contest for such purpose on Nov. 28 and 29, 2003. A total of 369 Korean and foreign martial artists from 16 countries joined the 1st World Taekwondo Muye(Martial Arts) Championships hosted by the World Taekwondo Headquarters. The participating nations included Singapore, Uzbekistan, Taiwan, France, the United States, and Iraq. The World Taekwondo Federation (WTF) and the Korean Taekwondo Association (KTA) sponsored the event. The opening ceremony on Nov. 28 was participated by taekwondo dignitaries including WTF President Kim Un-yong. For further details visit its official site.